S-adenosyl-l-methionine (SAMe; AdoMet) is an important, metabolically pleiotropic molecule that participates in multiple cellular reactions as the precursor for the synthesis of glutathione and principle methyl donor required for methylation of nucleic acids, phospholipids, histones, biogenic amines, and proteins. SAMe synthesis is depressed in chronic liver disease and so there has been considerable interest in the utility of SAMe to ameliorate disease severity. Despite encouraging pre-clinical data confirming that SAMe depletion can exacerbate liver injury and supporting a hepatoprotective role for SAMe therapy, to date no large, high-quality randomised clinical trials have been performed that establish clinical utility in specific disease states. Here, we offer an in-depth review of the published scientific literature relating to the physiological and pathophysiological roles of SAMe and its therapeutic use in liver disease, critically assessing implications for clinical practice and offering recommendations for further research. 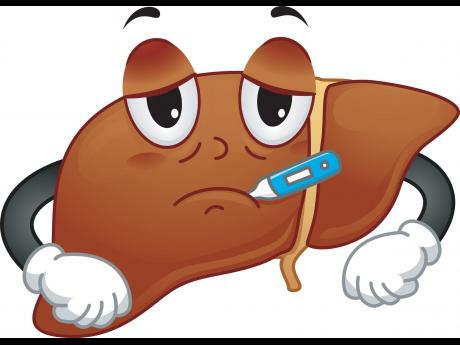 Liver disease is considered acute or chronic according to the duration of the injurious process. The process of hepatic fibrogenesis is triggered by tissue damage and continues until the lesion is healed. If the damage persists or is recurrent, the repair process will persist and fibrogenesis will progress towards cirrhosis, liver failure or hepatocellular carcinoma  and . Hepatocyte death, through a varying combination of oncotic necrosis and apoptosis, is a characteristic feature of most liver diseases including alcoholic liver disease (ALD), non-alcoholic fatty liver disease (NAFLD), cholestasis, viral hepatitis, ischemia/reperfusion, liver preservation at transplantation and drug/toxin-induced injury . Correction of the underlying aetiology before the development of cirrhosis and liver failure is the primary goal in managing liver disease. However, where this is not possible, treatment to ameliorate hepatocellular injury or control fibrogenesis offers an attractive therapeutic strategy that may prevent disease progression and, given that fibrosis has a reversible component, allow regression  and . At present, there are no accepted anti-fibrotic agents available outside clinical trials and, beyond the use of N-acetylcysteine (NAc) in the treatment of acute acetaminophen (paracetamol) toxicity, there are no widely adopted agents that limit hepatocellular injury in routine clinical use. Irrespective of aetiology, progression of liver disease is influenced by the interaction of host genetic factors, the pathogen, and other coincidental environmental influences . Nutritional status is one such factor . However, it has also become apparent that beyond dietary availability of specific nutrients and essential amino acids, an individual’s metabolic capacity for processing them into active metabolites and the factors that influence this can profoundly affect physiology in health and disease . The essential amino acid methionine and its biologically active metabolite S-adenosyl-l-methionine (SAMe; AdoMet) are a case in point: there is evidence that SAMe depletion occurs during chronic liver disease  and  and SAMe has been proposed as treatment for certain disease states  and . Due to encouraging data from early studies and the lack of other effective agents, SAMe has been widely adopted in Eastern Europe, Russia, China, Southern Asia, and South America as a therapy for chronic liver disease and intra-hepatic cholestasis. It is therefore timely to discuss the role of SAMe in the pathogenesis of liver disease and critically review the current evidence of clinical utility for SAMe supplementation. SAMe is synthesised from dietary l-methionine and ATP by the enzyme methionine adenosyltransferase (MAT; EC 2.5.1.6) in a complex two-step reaction  and . The complete tripolyphosphate (PPPi) moiety is cleaved from ATP at the C-5′ atom and the adenosyl moiety is transferred to methionine to form SAMe; PPPi is then hydrolysed to orthophosphate and pyrophosphate (PPi + Pi) at a distinct sub-site within the MAT catalytic domain; and finally SAMe, orthophosphate and pyrophosphate are released (Fig. 1) . In mammals, there are three separate forms of the MAT enzyme . The gene MAT1A is predominantly expressed in the adult liver and encodes a 395 amino acid α1 catalytic subunit that is combined into either a homotetramer (MATI) or a homodimer (MATIII) . In contrast, MAT2A is ubiquitously expressed in all mammalian tissues studied including foetal liver (and to a lesser extent in adult liver), erythrocytes, lymphocytes, brain and kidney ,  and . It encodes a 396 amino acid α2 catalytic subunit that combines with a non-catalytic 334 amino acid regulatory β subunit encoded by MAT2B to form the MATII isoform of the enzyme ,  and . MAT is a highly conserved enzyme throughout evolution with a 59% sequence homology between Escherichia coli and humans . Both the α1 and α2 subunits share approximately 84% amino acid sequence homology  however, the MATII α2/β dimer has lower substrate affinity (km) than MATI/III and its activity is negatively regulated by SAMe as intracellular concentration increases whilst MATI/III is not. These differences in regulatory and kinetic properties limit MATII activity, which is thought to contribute little to hepatic methionine metabolism in healthy adults under normal physiological conditions whilst the MAT1A coded isoforms (MATI/III) maintain high levels of SAMe synthesis (approximately 6–8 g/day) . Fig. 1. Metabolic pathways in methionine/SAMe metabolism. SAMe is synthesised from dietary L-methionine and ATP by the enzyme methionine adenosyltransferase (MAT; 1). In standard conditions, the majority of SAMe generated is used in transmethylation reactions. Glycine-N-methyl transferase (GNMT; 2) is the most abundant methyltransferase in the liver. Irrespective of the specific enzyme mediating the reaction, a common product is S-adenosylhomocysteine (SAH). SAH is cleared by conversion into homocysteine and adenosine in a reversible reaction catalysed by SAH hydrolase (3). Homocysteine is in turn metabolised through either the remethylation pathways or the transsulfuration pathways. In the former, homocysteine is remethylated by methionine synthase in a process coupled to the folate cycle (MS; 4) or betaine methyltransferase (BHMT; 5) to re-form methionine. Alternatively, the conversion of homocysteine to crystathionine by crystathionine b-synthase (CBS; 6) begins the transsulfuration pathway leading to cysteine and ultimately glutathione (GSH) (7, 8, 9). Folic acid and the co-factors vitamin B6 and B12 are required for functioning of MS (4), CBS (6) and BHMT (5), respectively. Modified from [10,11]. Synthesis of SAMe needs significant metabolic energy given the requirement to hydrolyse the three high-energy phosphodiester bonds of ATP for each SAMe molecule synthesised. To control these demands, MATI/III activity is regulated both at transcription level and through post-translational regulation. Sequencing the MAT1A promoter region has identified consensus binding sites for several transcription factors including C/EBP (CAAT enhancer binding protein), NF-1 (nuclear factor 1), and HNF (hepatocyte-enriched nuclear factor) . However, studies have demonstrated that, although MAT1A expression is limited to the liver, promoter activity is present in cells from other tissues and so this is unlikely to be the mechanism through which tissue specific expression is mediated. Beyond promoter activity, gene transcription may be controlled by DNA methylation that can directly impede binding of transcription proteins and can additionally influence histone deacetylation and therefore chromatin structure. Hypermethylation of two MAT1A promoter CpG sites has been demonstrated in foetal liver, hepatocellular carcinoma (HCC) and extra-hepatic tissues, whilst these sites were found to be demethylated in normal adult liver where the gene is expressed . Further, the degree of histone acetylation, necessary to maintain chromatin in a decondensed and active state for transcription, is modified so that the degree of H4 histone acetylation associated with the MAT1A promoter is approximately 15-fold greater in the liver than in tissues where MAT1A is not expressed such as the kidney . In human hepatoma cell lines (e.g. HepG2), MAT1A is hypermethylated and so not expressed, while exposure of these cells to the demethylating agent 5′-aza-2-deoxycytidine or to the histone deacetylase inhibitor tricostatin A promotes gene expression  and . Together, these findings indicate that tissue-specific MATI/III expression is primarily regulated through DNA methylation and histone deacetylation and that this may be affected by disease states (Fig. 2). Fig. 2. Regulation of MAT1A expression and MATI/MATIII activity in health and disease. Tissue-specific MATI/III expression is primarily regulated through DNA methylation and histone deacetylation and this may be affected by disease states. Greater CpG methylation is observed in extra-hepatic tissues and in cirrhosis and HCC where MAT1A expression is suppressed and less MATI/III activity observed. Modified from . Beyond limiting MATI/III expression to the adult liver, where there is a high capacity to generate ATP to fuel SAMe synthesis, there is an additional need to rapidly ‘fine tune’ SAMe synthesis according to variations in metabolic demand to prevent hepatocytes becoming ATP depleted at times of metabolic stress . Reactive oxygen species (ROS) and nitric oxide (NO) can inactivate MATI/III by oxidation or S-nitrosylation of the cysteine residue at position 121 in the α1 subunit, respectively, inducing a conformational change in the protein that blocks the catalytic site. This change can be equally rapidly reversed by exposure to physiological concentrations of the anti-oxidant glutathione, reactivating MATI/III [, , ]. Importantly, MATII does not possess a cysteine residue at the equivalent position and so its activity (which is regulated by SAMe concentration) is not influenced by oxidative stress. Indeed, inhibition of MATI/III under conditions of oxidative stress causes SAMe levels to fall, disinhibiting MATII. SAMe is an important, metabolically pleiotropic molecule that participates in multiple cellular reactions and influences numerous cellular functions. Biochemically, it participates in three types of reaction: transmethylation, transsulfuration and aminopropylation [, ]. A comprehensive discussion of these metabolic pathways falls outside the scope of this review however, the key reactions will be briefly summarised. SAMe is the principle methyl donor required for methylation of nucleic acids, phospholipids, histones, biogenic amines, and proteins . In standard conditions, the majority of SAMe generated is used in transmethylation reactions (Fig. 1). Glycine-N-methyl transferase (GNMT; EC 2.1.1.20) is the most abundant methyltransferase in the liver and is also present in the exocrine pancreas and prostate. Irrespective of the specific enzyme mediating the reaction, a common product is S-adenosylhomocysteine (SAH). Clearance of SAH by conversion into homocysteine and adenosine in a reversible reaction catalysed by SAH hydrolase (EC 3.3.1.1) is essential as many SAMe-dependent methylation reactions are strongly inhibited by SAH accumulation. 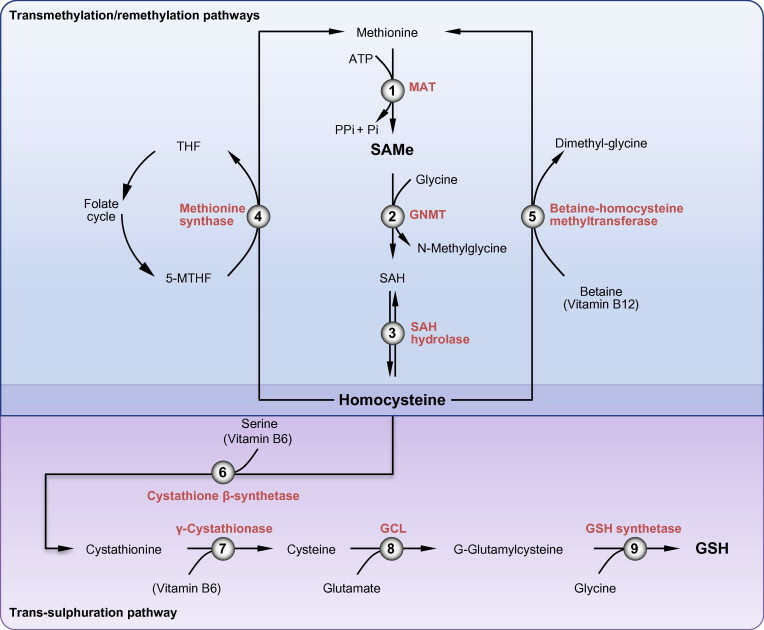 Homocysteine lies at the intersection of the remethylation pathway and the transsulfuration pathway through which homocysteine may be processed to form the primary endogenous cellular antioxidant, glutathione (Fig. 1) . In the former, homocysteine is remethylated by methionine synthase (MS; EC 2.1.1.13) in a process coupled to the folate cycle or betaine methyltransferase (BHMT; EC 2.1.1.5) to re-form methionine; although it should be noted that the role of BHMT is of much less significance in primates than in rodents . Alternatively, the conversion of homocysteine to crystathionine by crystathionine β-synthase (CBS; EC 4.2.1.22) begins the transsulfuration pathway through which the methionine derived sulphur atom in SAMe is processed stepwise into cysteine and ultimately glutathione (Fig. 1). These pathways are autoregulated by hepatic SAMe concentration which acts as a potent inhibitor of MS and BHMT activity and an activator of CBS so that excess SAMe is preferentially partitioned into glutathione . Folic acid and the co-factors vitamin B6 and B12 are required for functioning of MS, CBS, and BHMT, respectively, and so their availability will limit enzymatic activity and thus homocysteine levels and hepatic methionine handling (Fig. 1) . SAMe is also the precursor for the synthesis of polyamines that are needed to preserve cell viability and proliferation. Here, SAMe is decarboxylated by SAMe decarboxylase (EC 4.1.1.50) and the aminopropyl group used to from polyamines including the biologically active metabolite 5’-methylthioadenosine (MTA). Recognition that methionine metabolism is impaired in patients with chronic liver disease extends back more than 60 years to studies demonstrating reduced methionine clearance after liver injury . Independent of aetiology, patients with hepatic cirrhosis have been shown to have reduced MAT1A expression, lower MATI/III activity, with no compensatory increase in MAT2A expression and therefore hepatocellular accumulation of methionine and significantly reduced levels of SAMe [, ]. These changes are due to hypermethylation of the MAT1A promoter limiting gene expression in cirrhotic patients, however, the mechanism through which this occurs is not known (Fig. 2) . Furthermore, conditions that promote oxidative stress such as alcohol consumption, viral hepatitis, septic shock, and toxin exposure; or increase nitric oxide (NO) synthesis such as hypoxia and inflammatory cytokines (e.g. TNFα, IL-6) will inactivate residual MATI/III . Given that SAMe is a biochemical intermediary in glutathione synthesis, this in turn will further downgrade hepatocellular defences against oxidative stress and worsen liver injury. The effects of chronic SAMe depletion may be studied in the Mat1a null (MATO) mice . In these mice, hepatic hyperplasia is evident by 3 months of age; young animals are more sensitive to choline-deficient diet induced steatosis; and, consistent with the effects of methionine/choline-deficient dietary models , the mice develop spontaneous steatohepatitis by age 8 months . Gene expression profiling reveals that, even when the liver appears histologically normal, numerous growth, dedifferentiation and acute phase response genes are upregulated including proliferating cell nuclear antigen, α-fetoprotein, and Mat2a. MATO mice are also significantly more sensitive to the effects of carbon tetrachloride exposure than wild type animals, exhibiting higher levels of ALT, AST, and greater histological liver injury . Few human examples of spontaneous MAT1A deficiency have been reported, however, it is notable that neurological rather than hepatic dysfunction is the primary phenotype described (OMIM #610550). Beyond its role as a metabolic intermediate, there is evidence that the balance between MATI/III and MATII activation and therefore intracellular SAMe concentration can modulate cell proliferation in the liver. SAMe levels are high in quiescent hepatocytes but are much lower in proliferating cells . Studies in HepG2 and HuH7 cells demonstrate that when MAT2A is expressed, low SAMe levels promote more rapid cell growth whilst increased SAMe synthesis due to MAT1A expression or SAMe treatment is associated with slower growth . These findings are also supported by reports that the potent mitogen, hepatocyte growth factor (HGF), induces acetylation of histones associated with the MAT2A promoter, an effect that can be overcome by administration of exogenous SAMe [, ]. In vivo, following partial hepatectomy in the rat, SAMe levels are markedly reduced, coinciding with the start of DNA synthesis and regeneration. Once again, hepatocellular regeneration can be inhibited by SAMe administration . Underlining the clinical significance of the effect of SAMe on hepatocellular proliferation, SAMe depletion in Mat1a knockout mice is associated with spontaneous development of HCC [, ] whilst development of HCC in carcinogen-exposed rats can be blocked by SAMe treatment [, ]. Thus, SAMe depletion promotes increased cellular proliferation and growth. As a short lived response to an acute insult these changes may be beneficial: SAMe synthesis is reset to a new lower steady state preserving ATP, hepatocyte proliferation and growth are prioritised and the original liver mass restored. However, if injury becomes chronic, SAMe depletion may be deleterious as it favours malignant transformation and so SAMe supplementation, at least to physiological levels, may be beneficial. Given our current understanding of methionine metabolism and the physiological role of SAMe, it has been proposed that supplementation could both ameliorate liver injury and reduce the development of HCC in chronic liver disease. These effects cannot be achieved by giving methionine, even a 7-fold increase in methionine consumption was unable to significantly increase hepatic SAMe and could exacerbate the potentially harmful accumulation of methionine that is observed in cirrhotic patients [, ]. Administration of SAMe would, however, bypass MAT and theoretically avoid these problems. Before considering the evidence for specific disease states, we will examine the role of SAMe in hepatic pathophysiology and how this may be manipulated through therapeutic supplementation. A common feature in the pathophysiology of most inflammatory processes is the involvement of reactive oxygen species (ROS) such as superoxide, peroxynitrite, hydrogen peroxide, and the hydroxyl radical . Due to their high metabolic activity, ROS are generated continuously in hepatocytes and also, following liver injury, by cells of the innate immune system (e.g. Kupffer cells, infiltrating monocytes/macrophages, and neutrophils). These highly reactive chemical species react with cell membranes causing lipid peroxidation, induce DNA damage, activate c-jun-N-terminal kinase (JNK) and caspase signalling to promote apoptosis and cause oncotic necrosis . To counter this, intracellular ROS generation is largely confined to specific organelles including mitochondria and peroxisomes; several anti-oxidant enzyme systems have developed including superoxide dismutase (SOD), glutathione peroxidise, and catalase that detoxify ROS; and cells contain endogenous anti-oxidants which scavenge free radicals to mitigate against cellular damage, the most abundant of which is glutathione . As discussed above, SAMe is a precursor for the synthesis of cysteine and thus glutathione (Fig. 1) . SAMe has been shown to effectively increase intracellular glutathione concentration in murine models [, , , ] and in patients with liver disease . Importantly, SAMe can replenish hepatic mitochondrial glutathione and normalise fluidity of the inner mitochondrial membrane, which is critical for maintenance of function [, ]. It is tempting to speculate that these effects could underlie a reported amelioration of biochemical markers of chemotherapy-related liver injury described in three retrospective, observational studies from Italy, however, hepatic glutathione levels were not measured and so it would require further, prospective assessment to confirm these findings and determine mechanism of action [, , ]. There is evidence that, beyond its effect on hepatocellular ROS, SAMe may have additional beneficial effects modulating the balance between pro- and anti-inflammatory cytokines in liver injury . Experimental evidence of the ability of SAMe to attenuate pro-inflammatory TNFα-mediated liver injury, likely through downregulation of transcription factor NFκB, comes from a number of studies [, ]. Elevated glutathione levels may also help reduce TNFα-induced necrosis . In rats fed a methionine–choline deficient diet to induce steatohepatitis, SAMe was shown to reduce the induction of TNFα expression caused by exposure to bacterial lipopolysaccharide (LPS) . Both SAMe and its metabolite from the polyamine pathway, MTA, have also been shown to reduce TNFα production in vivo and in vitro following LPS stimulation of the murine monocyte cell line RAW264.7 [, ], and to induce anti-inflammatory IL-10 production in the same models [, , ]. The interactions between SAMe and apoptotic cell death pathways are complex. SAMe has been shown to inhibit bile acid-induced apoptosis in vitro [, ] and both SAMe and MTA can protect normal cultured rat hepatocytes against okadaic acid-induced apoptosis in a dose dependent manner, an effect thought to be mediated through reduced mitochondrial cytochrome-c release, caspase-3 activation, and poly(ADP-ribose) polymerase cleavage [, ]. However, SAMe has the opposite effect on cancer cells . For example, SAMe induces apoptosis in HepG2 and HuH7 cell lines via the mitochondrial death pathway . The reasons for the differential effect remain incompletely understood but two mechanisms have been proposed . Firstly, SAMe and MTA alter cellular phosphorylation state and alternative splicing of genes in cancer cells resulting in Bcl-xs induction and apoptosis; and secondly, SAMe and MTA have been shown to directly inhibit BHMT activity in cancer cells but not normal hepatocytes, perturbing homocysteine metabolism, and promoting endoplasmic reticulum stress and therefore apoptosis . These effects are consistent with the observed in vivo chemopreventive effects of SAMe in murine models of HCC where more apoptotic bodies were seen in tumours of SAMe-treated animals than in untreated controls [, ]. Cholestasis occurs in a number of disease states and results in an accumulation of potentially toxic bile salts in the liver and blood which in turn leads to oxidative stress, hepatocellular injury, bile duct proliferation, and ultimately hepatic fibrosis [, ]. Methylation status is recognised to be of fundamental importance to cell membrane function with phospholipid methylation influencing membrane fluidity and transport of metabolites and transmission of signals across membranes [, , ]. As a major methyl donor, availability of SAMe potentially has profound effects on these processes. Therefore, it has been suggested that SAMe depletion contributes to the development of intra-hepatic cholestasis by interfering with bile salt export pump (BSEP) activity . Furthermore, hepatocellular injury in cholestasis is frequently associated with glutathione depletion and so SAMe may help correct this . The efficacy of SAMe therapy has been examined in a range of chronic liver conditions, although historically the greatest interest has been in the area of intra-hepatic cholestasis (IHC). IHC is a syndrome that develops from impaired bile flow at the sub-lobular level. This may occur due to: (1) hepatocellular damage, including viral hepatitis, alcoholic hepatitis or prolonged TPN use; (2) canalicular membrane changes, often seen in drug-induced liver injury (e.g. oral contraceptives, antibiotics, etc. ); (3) genetic defects in bile transporters; (4) obstruction of the canaliculi or ductules; and (5) ductopenia . Clinically, IHC is characterised by the presence of pruritus or jaundice with elevated serum total bilirubin, alkaline phosphatise, and gamma-glutamyltransferase levels . The effects of SAMe treatment in vivo in rat models of surgical cholestasis (bile duct ligation) have shown some benefit. Rats treated with SAMe and then subjected to bile duct ligation for 7 days were found to exhibit less oxidative stress as measured by thiobarbituric acid reactive substances (TBARS) and to have a reduced ratio of oxidised to total glutathione . Perhaps unsurprisingly, given the nature of the model, both this and a similar study failed to detect any change in biochemical cholestasis (ALT, ALP, and bilirubin), area of hepatocellular necrosis or fibrosis [, , ]. The two largest studies that have examined the utility of SAMe therapy in this setting have both been conducted in patients with features of IHC due to a mixture of different aetiologies [, ]. One of the earliest was a multi-centre, double-blind placebo-controlled trial conducted in 220 IHC patients, many of indeterminate aetiology and of differing disease stage (68% cirrhosis, 26% chronic viral hepatitis, 6% PBC) . This demonstrated a significant reduction in clinical biochemical indices of cholestasis and improvement in symptoms of fatigue and pruritus after oral SAMe treatment (1600 mg/day). This study also showed that significantly more SAMe-treated patients reported a >50% increase in general well-being (SAMe 84% vs. placebo 29%, p <0.01) . These findings were supported by a subsequent Italian study. Here, 640 IHC patients were allocated to one of two different parenteral dosing schedules (500 mg/day im or 800 mg/day iv) for 15 days in a non-randomised, non-placebo controlled, observational study . The majority of patients recruited had chronic viral hepatitis with or without concomitant excess alcohol consumption and approximately 60% were cirrhotic at enrolment. Little additional information as to whether patients were inpatients or outpatients at the time of the study was provided. Over two-thirds of participants reported substantial improvements in subjective symptoms of pruritus and fatigue using a visual analogue scale and reductions in serum markers of cholestasis were also observed . Neither parenteral regimen was found to be superior to the other. Although these studies provide supportive evidence for the use of SAMe in chronic liver disease, the study cohorts were poorly defined and methodology was not to current standards for clinical trials. This is particularly so for the latter study, which was not randomised and had no control arm, making it difficult to confidently draw conclusions that influence practice. Importantly, neither study addressed duration of effect or whether this translated into any tangible prognostic benefit. There have been several smaller studies that have also examined symptom severity (fatigue and/or pruritus) as an end point [, , ]. The value of SAMe as a treatment for pruritus was addressed by the Agency for Healthcare Research and Quality in 2002 (http://archive.ahrq.gov/clinic/tp/sametp.htm) . In a meta-analysis of four smaller, heterogeneous studies addressing IHC of mixed aetiology unrelated to pregnancy (Table 1), the authors concluded that SAMe therapy was superior to placebo, significantly reducing pruritus (relative risk 0.45, 95% CI 0.37–0.55) and serum bilirubin levels (pooled estimate, p = 0.02) however, there was insufficient evidence to compare efficacy with other agents such as ursodeoxycholic acid . Table 1Selected clinical trials of SAMe in non-pregnancy related IHC. Cholestasis of pregnancy is associated with a high risk of adverse perinatal outcomes, including preterm birth (19–60%), meconium passage (27%), foetal distress (22–41%), and foetal death (0.4–4.1%) . Risk increases with fasting serum bile acid levels >40 μmol/L . The use of SAMe to relieve symptoms and lower bile salt levels in this condition has been studied by several groups. The largest study randomised 78 patients with cholestasis of pregnancy at <36 weeks gestation to SAMe, ursodeoxycholic acid (UDCA) or combination therapy until delivery. Both therapies were equally effective at improving pruritus, however, women receiving UDCA had a significantly greater improvement in the concentration of serum bile acids (p = 0.001) and clinical biochemistry than those receiving SAMe . A systematic review by members of the Cochrane Collaboration (performed in 2001 and updated 2010) identified five randomised control trials that met their inclusion criteria (these and others are listed in Table 2), however, analysis was hampered by their heterogeneity and several methodological problems were identified in the studies . The drug was generally well tolerated in all studies with no serious adverse events reported, however, the authors concluded that there was insufficient evidence to support the use of SAMe or UDCA in cholestasis of pregnancy . Table 2 Selected clinical trials of SAMe in cholestasis of , , , , , , .